NEW YORK (CelebrityAccess MediaWire) — Both Microsoft and AOL are both trying to get in with the cool crowd. As the entertainment landscape of continues t evolve, the giants of today are looking for ways to solidify their positions as innovators for the future. Microsoft has been gearing up to compete directly with the ten ton gorilla in the room, the iPod for some time. To bring the battle to Apple, Microsoft has been preparing its response, the Zune media player and is hoping to woo the trend-setting early adopters. Surely an uphill battle, but if anyone has the resources to make inroads, it is Microsoft. Their strategy is targeting a number of different demographics. They are making heavy ad buys with popular blogs, they plan a strong presence at events such as the CMJ conference as well as campus promotions. 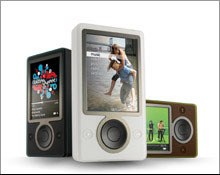 The device itself may help with this, as some of its features include networking capabilities that will allow it to wirelessly share music with other nearby Zune users. The device will also come preloaded with music from labels such as Ninja Tune, Sub Pop and Astralwerks. Microsoft isn't the only company hoping to seize a piece of the digital music landscape for itself. They are in a partnership with XM Radio to offer the satellite broadcaster's radio on their website, as well as re-launching Spinner radio. Spinner will focus on Indie music, including the Indie 500, indie electronic music, CMJ and new releases. AOL is also banking on a new weekly web-only program called "The DL" which will be hosted by comedian Sara Schaefer. The program will feature news and performances by up and coming indie bands.